Failed Democratic congressional candidate Jon Ossoff will be part of a panel discussion on Saturday to discuss how to have success in the 2018 midterms at the left-wing activist gathering, Netroots Nation. The 30-year-old documentary filmmaker and former congressional aide lost the most expensive U.S. House race in history to Republican Karen Handel in June. The two were vying to fill the sixth congressional district seat in Georgia vacated by Health and Human Services Secretary Tom Price. Ossoff also did not live in the district he was running for and thus was unable to vote for himself. Democrats have suffered severe losses in recent midterm elections. Because of redistricting, the 2010 elections devastated the party so badly that we have not yet been able to recover. And 2014 wasn’t much better. But the party in control of the White House usually loses ground in the midterms—and because of Trump, progressives are more mobilized than they have been in a decade. Just in time, too: not only is control of the House at stake, but the next round of redistricting is just around the corner. For 2018, where, and how, should progressive activists focus their energy for maximum impact? Our panel— comprised of a handicapper, a staffer, an activist, and a candidate—will approach these questions from each angle. It will be moderated by Daily Kos labor editor Laura Clawson, with Ossoff, operative Carolyn Fiddler, Daily Kos political director David Nir, and "potential candidate for Congress" Lauren Underwood serving as panelists. Democrats are hoping to win back control of Congress after two straight dismal election cycles for their party. Ossoff's inability to rectify his living situation was a sore spot throughout his candidacy. Washington Free Beacon reporter Brent Scher filmed himself taking two hours to walk from Ossoff's home into the sixth district the week of the race. The night before the June 20 election, Ossoff's campaign ejected Scher from one of his events, prompting a bipartisan outcry. Despite a flood of outside liberal money to bolster his campaign, Ossoff was unable to improve on his first-place finish against a crowded field of Republicans in April's primary. The Democrats spent $30 million only to remain winless in special House races during the Trump administration. 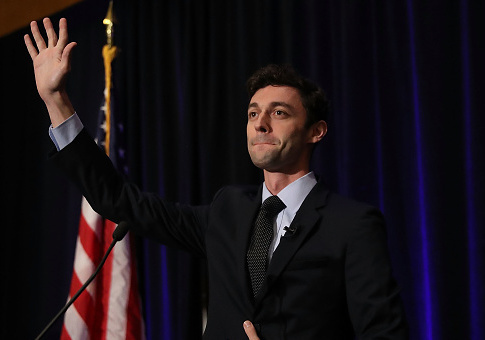 Ossoff and fellow progressives pointed to the district's traditionally red voting record as reasons for optimism, however. Ossoff is the only person listed in the Netroots panel website without a biographical description. Netroots Nation will take place at the Hyatt Regency Hotel in Atlanta, Georgia. It's inside Georgia's fifth district, where Ossoff lives. According to Google Maps, it's only a 5-and-a-half mile walk to the hotel from his home near Emory University. This entry was posted in Politics and tagged 2018 Election, Jon Ossoff, Netroots Nation, Tom Price. Bookmark the permalink.